PGDRD i.e. post graduate diploma in rural development is one of the popular courses in the IGNOU. If you have good interest about the rural development, then this course is very much useful for you. If you want to do MBA in rural development, this course will help you in learning the basics of rural development. In this course of IGNOU, you have to submit the PGDRD Project. For this RDD 05 Project Work, you have to write the project synopsis first and after getting the approval from your supervisor, you need to write the final Research Paper for completing the Project Work of PGDRD. We are also providing help and guidance of making the RDD 05 Project Work. I will teach you about how to prepare the research synopsis for the PGDRD Project of IGNOU and also give you suggestions on data collections, literature review and all other points that we have to cover in this PGDRD Research Paper. Numbers of students from various parts of India asked me for some tips about how to crack the IGNOU MSW exams. 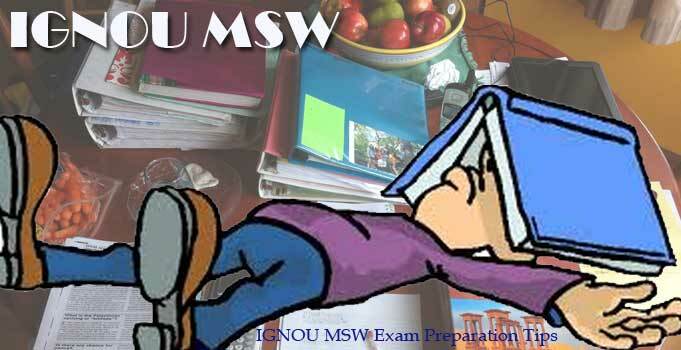 Here I am writing a blog post about how to pass the IGNOU MSW exam. First of all, the MSW / BSW question papers have many lengthy questions like 600 words, 300 words, and 150 words. So I will suggest you to do some writing practice so that you can attempt the whole paper. It is very necessary to attempt all of the questions for getting good marks. I will suggest you to start the question paper from the 100 words short questions and try to finish all of them within half hour or 40 minutes. Then go for the 150 words question paper and try to finish within 45 minutes. The long questions take long time to think the content and write. I will also suggest you to download previous years question papers and try to make some short notes so that you can cover the whole topics easily. Try to make handmade notes as they are very easy in doing the revision. Do not reproduce the bookish language in the exam. Try to write in your own language. Keep the short but clear titles and draw figures if necessary. Paragraphs should be concise. You can get the IGNOU December 2014 Exam Results on the official website of IGNOU. The exam result can get by providing the 9 digit enrollment number. Good news for the IGNOU BSW final year students. Campus Placement Cell (CPC) of Indira Gandhi National Open University (IGNOU) in association with all Regional Centres of Delhi NCR is organizing Two Day Campus Placement Drive during January 30-31, 2015 at Convention Centre, IGNOU Campus. The programme has been planned with a financial solution company, BMA Wealth Creators, Noida. The placement drive will be carried out during 10.00 AM to 06.00 PM on both the days for the final year students of BA, B Com, B Sc, BTS, BSW and BCA from Delhi NCR for more than 500 vacancies. For the field work training, you must have effective team work skills. Here is a list of some of the most important skills required for the good team work. Team work plays an important role while doing the social work. During the field work training, it is very necessary to use best skills you have. Take help of your seniors and other co-workers if you are facing any problem while working as a team member. The communication should be good and clear. You must have good understanding about your organization. Also respect your seniors for getting good support from them. Here are some notes and important updates on the CBSE/UGC NET Social Work. Good morning and Happy Independence Day. The marks of some of the subjects are not uploaded yet and they will be updated within 10 days. So keep checking the website of IGNOU for the final grade card. Best of Luck to all students. Here is the list of IGNOU MSW Field Work Journal Important Component. In the first year, you need to write following reports in the journal provided by the IGNOU. So you have been started the study for your MSW exam. I am sure that you are not going to staty the entire blocks of IGNOU MSW Course. So I am here to provide some tips about how to prepare for the MSW exam. First of all download the last 5 years question papers from the IGNOU website and prepare the topics only. If you are facing any problem in downloading the previous year’s question papers of MSW course, contact me. I will send you the right links of IGNOU MSW previous years question papers. Also I will suggest you to make practice of writing as the questions are very long consume huge time to write. Write 3-4 pages each day so that you can get the good writing speed at the examination hall. Attempt all the questions in exam. Start from writing the 600 words questions as they take big time to complete. For the 600 words answers, you need to make an introduction, after that main body and in the last the conclusion of the answer. There will be internal choice in all questions so read all the questions carefully and attempt the best questions you can prepare. Best of luck for your IGNOU MSW exam. Field work is the important component in the IGNOU MSW course. You have to do field work in both years of study. In the first year of journal MSWL001, we have to cover reporting on induction meeting, five ngo’s orientation visits, 45 concurrent reports, individual and group conferences with a self evaluation report. And in the second year of study i.e. in the MSWL002, the entire first year activities will be there and you have to perform some other important activities and sessions. So the second year field work is more important as compare to the first year. The second year of field work will give you complete knowledge of doing the social work with individuals, group and community. You will use various social work techniques in the second year like interview, focus group discussion, event organizations and social action.